One result of Windows Phone arriving late to the smartphone party is that the mobile Xbox Live lineup consists mainly of iPhone ports, with a few exclusives here and there. Many of the iPhone games are outright classics like Doodle Jump and Angry Birds, and we’re all better for having them available to us. But not every iPhone game is worth playing; for every big hit, many, many terrible games make it through as well. One such flop made the jump to Xbox Live for some reason: Pangaea Software’s Cro-Mag Rally. The Windows Phone port comes courtesy of Citizen 12 Studio. Cruise past the break for our full review. Most of Cro-Mag Rally’s problems stem from its age. 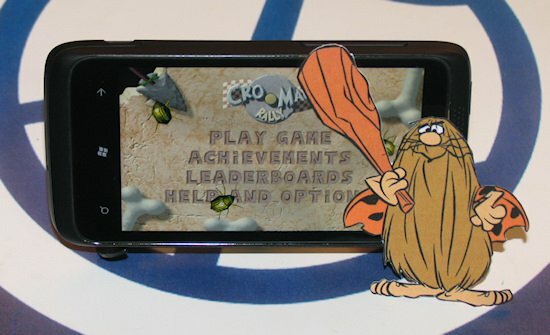 The caveman-themed kart racer debuted in 1998 on Macs before migrating to iPhone in 2008. Even if we ignore that the original version (to which this one closely hews) is more than 10 years old, that still makes this a port of a three-year old iPhone game. That wouldn’t be so bad if it was a fantastic game to begin with, but that is not the case, as I’ll explains shortly. Nor have its shortcomings been rectified in the process of bringing the game to Windows Phone. Imagine if someone had released the original Atari 2600 E.T. : The Extraterrestrial as-is and slapped some Xbox Live Achievements on it; that’s basically Cro-Mag Rally in a nutshell, but with cavemen on karts. I am not a graphics whore. I can frequently enjoy games with simplistic graphics or awkward art styles, but even I have limits. Cro-Mag Rally is hands-down the most hideous 3D game in the mobile Xbox Live lineup. The fault here lies mostly with the original developer, as the game has always been an affront to the eyes. The character designs of the two playable cavemen are so atrociously, heinously bad. They make a decent case for regulating art and turning the world into a dystopian police state, if only to protect gamers from having to see such horrid things. At the very least, the original art designer needs to look for a new field of work, such as the custodial arts. Looking past the cave-monster drivers (which you pretty much have to do in order to protect your retinas), the game sports some low-end Playstation One-era 3D visuals. Every single object in the game is overly angular and lacking in definition. The textures don’t pick up the slack due to their low resolution, and the colors are generally garish. Put Cro-Mag Rally up against a recent game like Jet Car Stunts or even the other WP7 launch racing titles and it comes up way short. Now, those problems all came from the original game, though I question the wisdom of not cleaning up and enhancing the graphics during the porting process. But one area where the port really drops the ball is the design of the Windows Phone-specific UI screens. The Settings menu and Credits screen look haphazardly thrown together. They use tiny fonts that don’t fit with the rest of the game, and would definitely have benefitted from some cleanup. Cro-Mag Rally lacks a metagame, simply presenting gamers with a selection of tracks and an assortment of vehicles with varying stats to race with. The included tracks show some creativity and promise, as they include fun locals like The Great Wall (Ancient China), a Viking Village, and a couple of Stone-age era tracks. Living set pieces like dinosaurs, yetis, and mummies instill a bit of character. Also, every stage has its own tune that fits it perfectly; the music is the best part of the game. The actual course design is where this game’s tracks fall apart. 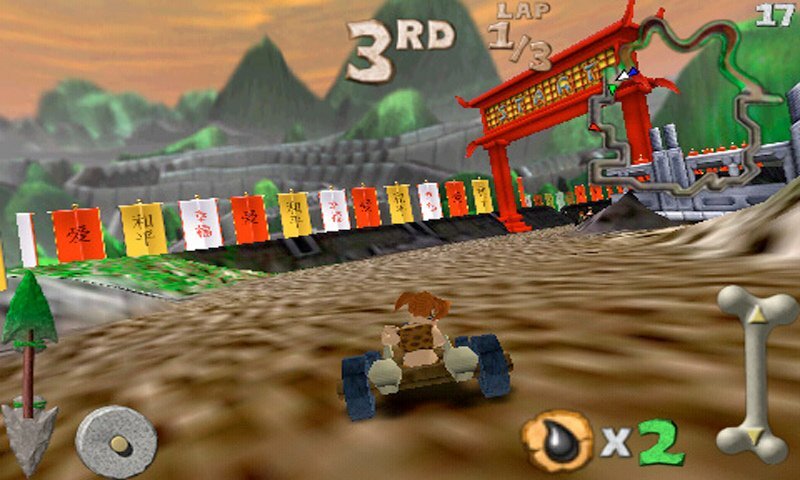 Every track is littered with way too many random obstacles, most of which stop the player’s kart in its tracks when hit. There are also aggressive obstacles like tornados and statues that shoot lightning at drivers, knocking them about wildly. Instead of enhancing the gameplay experience, all of these things only serve to annoy. Many tracks are filled with repeated tight turns that the karts can’t properly keep up with, too. While Cro-Mag Rally is obviously inspired by Mario Kart, the designers don’t seem to understand the game they’re copying well enough to do it justice. Each of Cro-Mag Rally’s tracks can be played two ways: Race and Gather. Race is a traditional race against three other drivers with the object of coming in first. Race is kind of fun at times, but Gather is not. Here players must not only try to come in first but also collect 8 arrowheads that are scattered around the track. Unfortunately the rotating sprites of the arrowheads are way too hard to see, especially as the backgrounds often use a lot of the same grays as they do. Gather races also bring Cro-Mag Rally’s physics and control problems to the forefront. Steering utilizes tilt controls and works fine. Citizen 12 famously added an auto-accelerate feature to the game post-launch. But the overall speed of the game is just too fast for a kart racer, especially with the frequently narrow and winding track design. As a result, it often feels like you’re careening out of control, necessitating constant breaking to keep things in check. Turning around to pick up the tiny arrowhead sprites is torturous due to the unnecessarily high speed as well. Oh, I almost forgot to mention weapons and powerups. They’re small and hard enough to pick up, just like arrowheads. Most weapons can be fired forward or backward, depending on whether players hit the top or bottom of the fire button. But again, the game’s annoying speed (and the finicky performance of the fire button) makes actually hitting enemies an extremely rare occurrence. Cro-Mag Rally has a variety of Achievements, including a few creative ones like hitting all of the cacti in the Desert track. Unfortunately, the game’s weaker mode, Gather, gets several Achievements. Players will need to collect all 8 arrowheads from every track in the game, including the unfathomably bad Atlantis track. Atlantis takes place underwater with submarines instead of karts. It adds unnecessary vertical movement into the equation and removes the brake button. It’s also dark and the submarine produces bubbles that obscure the player’s view, so collecting the arrowheads there is a complete chore. Except for enduring that misstep of a course, the Achievements are actually quick and easy to get. Cro-Mag Rally is a game that should have been allowed to languish in obscurity rather than receiving the Xbox Live treatment on Windows Phone. Perhaps it was fun back in 1998, but I think any positive reputation it earned is due more to the scarcity of Mac games during that era rather than actual quality. Pangaea has announced an overhauled iPhone version with new graphics and UI, but it’s unclear whether those improvements will trickle down to Windows Phone. As it stands, the only reason to get CMR is its easy Achievements. I feel for Citizen 12, who took on the unenviable task of polishing a turd, which never works. They just need to choose more compelling games to port in the future. Cro-Mag Rally costs $2.99 and there is a free trial. Pick it up here on the Marketplace.